AHCA/NCAL hosted its annual Congressional Briefing in Washington, D.C. Monday and Tuesday, allowing for hundreds of long term and post-acute care providers to gather in the nation’s capital, hear from leading voices in health care policy, and advocate in front of their lawmakers. Over 400 AHCA/NCAL members from 48 states and the District of Columbia gathered in Washington and met with nearly every Congressional office. The advocates spoke to the increasing quality of care in their facilities despite immense financial pressure on the profession. The group asked that common-sense regulatory relief be given now to prevent contraction of the profession just when the Baby Boomers are aging into retirement. 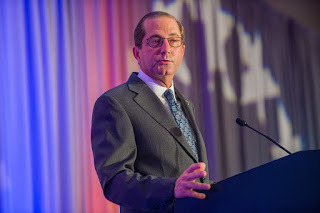 The event featured several prominent leaders in health care, journalism, and politics. The group heard from Secretary of Health and Human Services Alex M. Azar II, Senator Ben Cardin (D-M.d. ), and Pulitzer Prize-winning journalist Carl Bernstein. Secretary Azar spoke on a number of topics, ranging from the necessity of Health and Human Services to encourage providers to adopt electronic health records to the important role the long term and post-acute care profession has in combatting the opioid crisis. Sen. Cardin also spoke about the importance of these providers and the need for lawmakers to recognize the dire financial situation in which the profession finds itself. The next Congressional Briefing is already scheduled for June 3-4, 2019 in Washington, D.C. at the Hyatt Regency. In the meantime, AHCA/NCAL members are encouraged to follow up on their Congressional meetings by inviting their lawmakers to tour their buildings this summer.